We continue to carry out company-wide efforts to conserve energy through the Cool Biz dress code and encouraging the use of stairs when moving between floors and to turn off office lighting during lunch breaks to cull lighting. We also continue to make facilities more energy efficient by switching to high efficiency air conditioners and lighting and using LED lighting at new buildings. As a result, in fiscal 2015 we were able to reduce power consumption by 2.8% year on year and our CO2 emissions by 2.4% year on year. * Calculated based on the Act on the Rational Use of Energy Article 7 Item 3. Numbers indicate total energy consumption by properties in which we have invested, properties which we operate, and public welfare properties. Total emissions in each fiscal year have been recalculated by applying the fiscal 2009 coefficient. Dai-ichi Life not only uses energy at its real estate properties, but also consumes a large amount of energy from the daily shipment of contracts, manuals, applications, invoices and customer notifications between its nationwide network of offices. As part of our measures to prevent global warming, starting in fiscal 2010 we examined both energy usage and cost of distribution between our offices, reduced the weight of documents and booklets, changed our in-house distribution operations (changed the size of shipping bags and reduced distribution volume), and decoupled our parcel depots. Dai-ichi Life consumes a large amount of paper to send out various notices to its customers. We have stepped up efforts to reduce printed materials and the use of office paper by promoting the digitization of insurance enrollment procedures and the adoption of paperless meetings. In fiscal 2016, total company-wide paper usage increased over the previous year largely due to notices sent out regarding the company's transition to a holding company structure. We will continue to pursue initiatives to reduce our paper consumption moving forward. Brochures and other printed materials for customers and documents for internal use that make up approximately 50% of paper used in the entire company have been combined or eliminated and policy provisions have been replaced with electronic documents since fiscal 2008. Promoted elimination, consolidation and digitization of customer notices, etc. We promoted the elimination, consolidation and digitization of customer notices after evaluating volume, and in fiscal 2008 we took steps to significantly reduce the types of distributed material. Revised the policy conditions provided during the term of the policy We began creating customized policy conditions that are provided to customers during the term of their policy. This enabled us to reduce the average paper usage per policy by some 240 pages. Changed policy conditions provided at the time of application to a CD-ROM format Starting in October 2009 we began providing policy conditions provided at the time of application in a CD-ROM format. This helped us to greatly reduce the number of pages in our guide on policy terms and conditions provided to policyholders. Efforts to Reduce Office Paper Usage We have stepped up our company-wide efforts to reduce the amount of paper used in office Specific measures include voluntary efforts from employees, such as utilizing projectors, reducing meeting handouts, and using double-sided and 2-in-1 printing, as well as the digitization of administrative processes. Reduced Mailbox File printouts Starting in fiscal 2010 we changed the types of Mailbox File records, which helped us reduce paper used in office equipment by about 14.4 million sheets per year. Switched the paper used for our insurance design documents from specialized paper to all-purpose paper We reduced paper usage by 1,733 tons compared to the previous year by reducing inventory through cutbacks in types of specialized paper and by reducing the unit weight of paper through the switch to all-purpose paper. Digitized enrollment procedures and created DVDs for Contract Guide—Articles of Incorporation and Policy Provisions We made the enrollment process from insurance explanation and design to application entirely paperless, and recorded contract guides and terms and conditions for all products on a single DVD-ROM. These efforts helped reduce paper usage by 752 tons from the previous year. Introduction of Projectors and Screens By installing large screens at each branch and sales office, we reduced by volume of distributed materials in an effort to promote a paperless office and boost productivity. We are committed to reducing our impact on the environment by making efforts to reduce paper usage and recycling certain paper waste. Each of our offices collects paper waste and sends it to the head office for processing. All of this paper is in turn sent to a paper company to be chemically dissolved for reuse in cardboard and toilet paper as recycled paper. We stand committed to further reducing our impact on the environment through greater recycling going forward. * Total paper waste volume includes the portion of documents that have been saved prior to 2009. We proactively utilize environmentally conscious recycled paper to print envelopes and our business cards as part of our efforts to conserve resources. Starting in fiscal 2009, we made changes to the paper used to print our envelopes and business cards, while at the same time reducing the large number of envelope types for the benefit of the environment. We closely monitor water usage at each of our business offices. We are also working to continually reduce water usage at these business offices by installing water conservation equipment. At the same time, these business offices are also actively making use of reclaimed water. Used business machines, office equipment and furnishings from our business sites are disposed of as industrial waste after issuance of an industrial waste manifest in accordance with Japan's Wastes Disposal and Public Cleansing Act. Our head office has been charged with the proper management of industrial waste, and as part of this effort we have been checking the issuance of such manifests at each of our offices nationwide in Japan once per year. Dai-ichi Life calculates the amount of CO2 emissions it produces indirectly (Scope 3) given rising demand from society. In fiscal 2016, we calculated our indirect CO2 emissions for 3 of the 15 categories under Scope 3. With some 284 investment properties located nationwide in Japan (as of March 31, 2017), Dai-ichi Life is working to conserve energy from both the hard and soft aspects of these buildings. In terms of hardware, we strive to improve environmental performance by installing high efficiency equipment whenever buildings are constructed, remodeled or rebuilt, and we are committed to building greenery efforts as well. Additionally, in terms of the soft aspects, or daily property management, we work side by side with The Dai-ichi Building Co., Ltd. and other property management firms to continually make improvements and increase energy conservation performance. 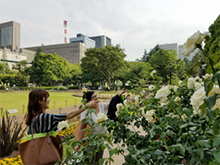 We are helping to roll out the latest technologies to protect the environment in various facets with an eye on the future and we created a green space of approximately 3,000㎡ called Kyobashi no Oka to help reduce the urban heat island effect. The Kyobashi Environment Station was also placed in the building as an advanced initiative to promote energy conservation in the area as a whole. It presents information on area energy management and environmental technologies. This building construction project was selected by the Ministry of Land, Infrastructure Transport and Tourism as a leading housing/building project in CO2 control, and also has been recognized by many organizations. 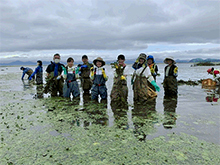 We hold environmental training sessions for employees during Japan's Environment Month so that we can foster greater awareness among individual employees toward protecting the environment as well as educate them on serious environmental issues and the impacts on Dai-ichi Life, with the goal of encouraging employees to take appropriate action for the environment. We conduct an environmental self-assessment test through our intranet system to measure the knowledge and efforts of individual employees. This self-assessment test features questions not only on our environmental initiatives, but also current environmental events to check the efforts of individual employees. This enables us to enhance knowledge while raising greater awareness. We have been promoting green procurement, which prioritizes purchases of products with less of an impact on the environment, since fiscal 2009. We have established Green Procurement Guidelines and office consumables that conform to these green purchasing standards must be purchased through our in-house procurement system.Therefore, nine tenths of our stationery such as envelopes and business cards are complied with green procurement. Dai-ichi Life owns a large number of real estate properties. As such, we carefully monitor our compliance with relevant laws and regulations to ensure we eliminate environmental risks and factors behind environmental impacts, such as soil pollution, asbestos and PCBs (Poly Chlorinated Biphenyl), from these properties. Dai-ichi Life re-inspected all of its properties from fiscal 2009 to fiscal 2012 and took appropriate measures where required based on asbestos laws and regulations that contain rules on the prevention of asbestos related health damages. We properly manage PCBs by monitoring the use of equipment containing hazardous PCB, such as capacitors and large transformers, and continually ascertaining the storage status of PCB waste. We also make reconfirmations at the time any property is sold in order to prevent the transfer of PCB waste. Disposable PCB waste is processed using proper means through contracts with disposal facilities and only after acceptance of such waste can be coordinated. We are adequately equipped to list the equipment with fluorocarbons such as air-conditioning unit and industrial refrigerator, in accordance with Act on Ensuring the Implementation of Recovery and Destruction of Fluorocarbons concerning Designated Products enforced on April 2015. We ensure an appropriate response to real estate acquisition in accordance with the relevant laws and regulations, and examine the eligibility based on environmental survey such as engineering reports. As an institutional investor that controls approximately 35 yen trillion in capital, the Dai-ichi Life's approach to asset management focuses not only on stability and profitability, but also on the benefits for society and the public. Details of our activities are presented below. Dai-ichi Life supports urban greenery initiatives and sustainable community development plans in order to support comfortable and healthy lifestyles through contributions to local environmental conservation and global environmental protection. Dai-ichi Life participated in “Japan Business and Biodiversity Partnership”, that is established by business operators giving their approval to the Action Policy and economic associations, NPO/NGO and government to support such business operators. Dai-ichi Life is supporting the three urban greening awards - the “Green Environmental Plans Award” , the “Green Cities Award” , and the “Competition for Specialized Greening Technology for Rooftops and Wall Facings”. The awards honor support, achievements and technologies related to urban greening. The purpose of the three awards is to promote and conserve urban greening. They contribute to prevent global warming and to conserve biological diversity. Employees of Dai-ichi Life are involved in volunteer activities, all departments promote such activities. Especially, we can take clean-up activity as an example of volunteer activities for environment conservation. We participate in clean-up activities of the flaats and bird sanctuary as well as beautification activities around the offices.